From Juliska's Country Estate Collection- embark upon every daily adventure with a piping hot cup of coffee, whether you go punting on the river or play a round of golf. Featuring Boathouse, Golf Hut, and Stable. 12 oz. capacity. 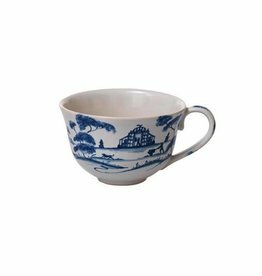 Country Estate Mug - Delft Blue - 3.5"W x 4.5"H - 12 Oz. Country Estate Large Serving Platter Main House - Delft Blue - 18.5"
Country Estate Mug - Flint - 3.5"W x 4.5"H - 12 Oz. From our Country Estate Collection- Our bowls serve as perfect vessels for the morning cereal or your proverbial cherries. Life is lovely when you have a bowlful. Featuring: Hen House, Tea Party Tent, Apple Orchard, and Rose Arbor. From our Country Estate Collection - Nestle our teacup upon its idyllic saucer, close your eyes, and sip away... Featuring Kite Fliers. 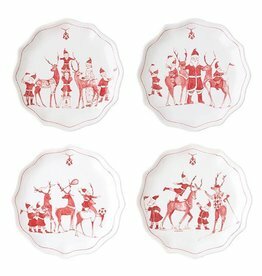 From Juliska's Country Estate Collection - Nestle the teacup upon its idyllic saucer, close your eyes, and sip away... Featuring Kite Fliers. 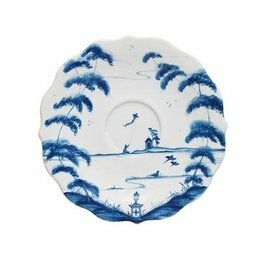 From Juliska's Country Estate Collection- Featuring narratives of the English Countryside, our 5 piece place setting in Delft Blue contains a charger, dinner plate, side plate, coffee/tea cup and saucer. From Juliska's Country Estate Collection - Nestle our teacup upon its idyllic saucer, close your eyes, and sip away... Featuring Kite Fliers.